ATTENTION: The year 2014 has concluded its temporal self-destruct sequence. If you are among the escapees, please join us in salvaging and preserving the best games from the irradiated chrono-debris. One game to rule them all, one game to find them; one game to bring them all and in the darkness bind them. Middle-earth: Shadow of Mordor brilliantly defies so much of its own definition – it's a game based on a movie franchise based on a beloved series of books, a description that is normally worthy of a grimace and a passing glance. Instead, Shadow of Mordor is not only a truly excellent fantasy-action game, it introduces an innovative and playful enemy-character system that is sure to be replicated in the industry for years to come. Perhaps part of Shadow of Mordor's charm stems from its surprise factor, the fact that no one expected it to be good, let alone become a leading creative force in a seemingly stagnant AAA industry. The main possibility landscape features Talion, a man seeking vengeance and answers from the dark powers that killed him in a ritual sacrifice, and his Elven spirit guide, Celebrimbor. The two are bound by resurrection, and together they utilize super-human powers to slaughter thousands of Uruk and avenge their own deaths. However, much of the game's pleasant surprise comes down to the Nemesis System, a beautifully crafted game of power and death within the larger open world. The Nemesis System allows players to become military strategists among the ranks of evil, nasty Uruk, by lining up the Uruk Captains and delineating the Uruk guards, foes and allies that serve beneath them. 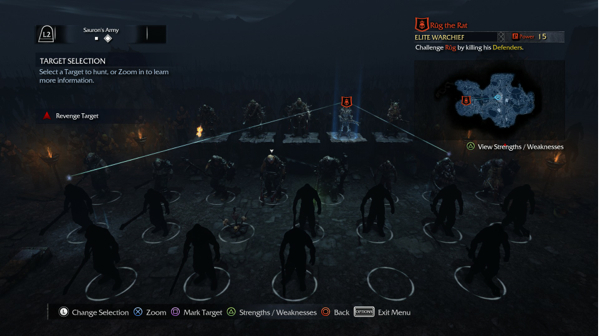 While slaughtering Uruk on the craggy hills of Mordor, players are able to forcefully withdraw knowledge from certain foes that applies directly to the Nemesis System, showing the weaknesses, strengths and allegiances of individual Uruk, shaping the strategy behind each mission throughout the game. The Uruk have enemies within their own ranks and often kill each other to gain power, and the Nemesis System demonstrates how this in-fighting impacts Talion's progress, while also providing a glimpse into an unexplored area of Lord of the Rings lore (and the 'bosses' to come). This not only provides context to Talion's journey, but it offers a new way for players to approach individual battles and the overarching narrative within Mordor. Outside of the Nemesis System, Shadow of Mordor is brutal. It portrays the brackish gore of killing Uruk over and over and over again, at times in unabashed slow-motion – necks sliced cleanly though, swords through guts and chests, heads exploded with handy telekinesis. The game's gruesome nature is on-point for the game and the universe – Uruk are evil death machines that revel in the torture and killing of all other creatures. Slaughtering Uruk is a public service, and Shadow of Mordor allows players to truly enjoy every death, whether by blade, animal or supreme cosmic power. Shadow of Mordor is easily distilled as "a mix of Arkham and Assassin's Creed," but it is far more than the sum of its parts. It draws inspiration from only the best aspects of its predecessors, offering free-range parkour and approachable one-man battles against endless onslaughts of enemies, and then it adds something completely new – the Nemesis System – behind Talion's every action. It's a smart game as well as a gruesome one, and it represents true, refreshing innovation in the newest generation. Shadow of Mordor is the first of its kind – and it's also our No. 1 game of 2014. Joystiq has chosen its 10 favorite games of 2014. Keep reading for more personal picks in Best of the Rest roundups.